--From the SNES Final Fantasy 3 instruction manual. 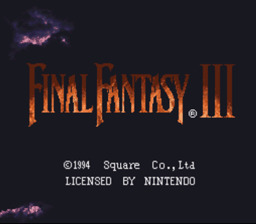 Play Final Fantasy 3 Now! single to multi, then hit A and assign to the controllers. It only works for the battles though, not the regular game-play. If you have the spells Vanish and Doom (or X-Zone), you need just cast Vanish on the enemy you want to destroy (this makes all magic hit 100%) then use Doom or X-Zone.